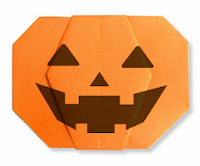 Halloween Origami: Jack O' Lantern - A jack-o'-lantern is typically a carved pumpkin. It is associated chiefly with the holiday of Halloween and was named after the phenomenon of strange light flickering over peat bogs, called ignis fatuus or jack-o'-lantern. In a jack-o'-lantern, typically the top is cut off, and the inside flesh then scooped out; an image, usually a monstrous face, is carved onto the outside surface, and the lid replaced. At night, a light is placed inside to illuminate the effect. Sections of the pumpkin are cut out to make holes, often depicting a face, usually with a menacing expression like that of a demon or the devil. A variety of tools can be used to carve and hollow out the gourd, ranging from simple knives and spoons to specialized instruments, typically sold in holiday sections of North American grocery stores. Printed stencils can be used as a guide for increasingly complex designs. 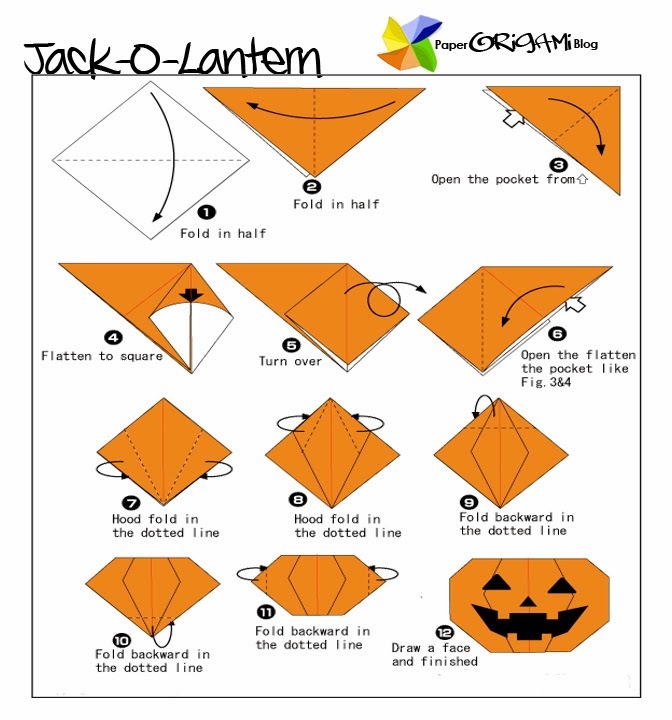 After carving, a light source (traditionally a candle) is placed inside the pumpkin and the top is put back into place. The light is normally inserted to illuminate the design from the inside and add an extra measure of spookiness. Sometimes a chimney is carved, too. It is possible to create surprisingly artistic designs, be they simple or intricate in nature.